Fiji booked their first appearance in the Rugby World Cup quarter-finals for 20 years with a 38-34 win over Wales in their crucial Pool B clash at La Beaujoire in Nantes. Wales were sent crashing out of the World Cup by Fiji in an extraordinary encounter at the Stade de la Beaujoire in Nantes. Fiji had stormed into a 25-3 lead with three tries in the space of 12 first-half minutes, from Gloucester's Akapusi Qera, winger Vilimoni Delasau and lock Kele Leawere. After Alix Popham touched down for a pushover try shortly before the interval, Wales produced a spirited comeback to edge ahead with further scores from Shane Williams, Gareth Thomas and Mark Jones. Wales appeared to have the match won when Martyn Williams picked off a pass from Nicky Little and raced clear to score. But Fiji refused to be beaten and a try from Graham Dewes four minutes from time sealed the islanders a quarter-final tie against South Africa. Wales and Fiji were going head to head for a place in the World Cup quarter-finals and the right to face South Africa in Marseille next Sunday. Wales were boosted by the return to fitness of captain Gareth Thomas, who recovered from rib cartilage damage to become the first Welshman to win 100 Test caps. Lock Ian Evans was thrown straight into the team for his first start since December last year after making an impressive comeback from a long injury lay-off as a replacement in the win over Japan nine days ago. Fiji returned to full strength with captain Mosese Rauluni, Leicester centre Seru Rabeni, Saracens full-back Kameli Ratuvou and Gloucester flanker Akapusi Qera all included in the starting XV. 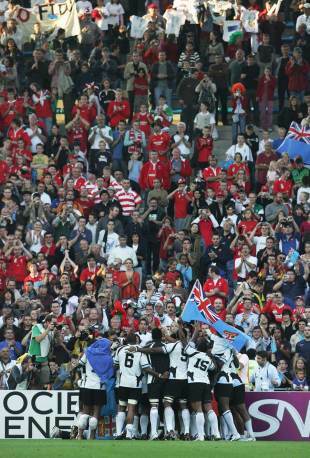 Wales had never lost to Fiji in eight previous encounters - and this was not the time to start. To be knocked out of the World Cup before the quarter-finals would be considered a failure. But victory over Fiji would secure Wales a place in the last eight and match their World Cup achievements from 1999 and 2003. Wales flanker Colin Charvis had outlined during the week out how important it would be to land the first punch, metaphorically, against Fiji. And Wales started a rip-roaring pace with fly-half Stephen Jones cutting through the defensive line with Tom Shanklin on his left shoulder. Winger Mark Jones was stopped just before the line in the left corner but Wales won quick ball and looked to exploit an overlap on the opposite touchline. But the Fiji defence recovered well and Shane Williams put a foot in touch as he tried to squeeze past giant opposite number Vilimoni Delasau. Wales were in the ascendance and Jones kicked them into a 3-0 lead but saw his second shot at goal rebound off the post. Fiji had soaked up the early pressure well and then smashed Wales twice in the space of five minutes with their lethal combination of heavy tackles and ruthless finishing. James Hook turned the ball over under a huge hit from Rabeni and despite Jones' best efforts to stop winger Isoa Neivua the Fijians had the momentum and Qera scored under the posts. Within minutes Wales were stung again as Fiji attacked from deep. Rabeni was again at the heart of it as he broke down the right before offloading to Delasau. The winger, short on space down the right, chipped in-field and then beat both Mark Jones and Thomas to regather in the in-goal area and touch down. The try was confirmed by television official Carlo Damasco and although Nicky Little missed the conversion he extended Fiji's advantage to 15-3 with a 45-metre penalty. Fiji were insatiable and unstoppable. Wales' fragile confidence was shattered. Little landed a second long-range penalty as Wales were once again penalised for not rolling away. Qera, already a sporting icon back home, enhanced his growing reputation further by breaking through midfield to once again leave Wales on the rack. Qera twice linked with Seremai Bai and Wales could not halt the Fijian charge and lock Leawere crashed over for their third try. Little's conversion opened up a 25-3 lead for Fiji. Wales trailed by the same scoreline at half-time against Australia and could not come back. Wales had to produce something. They pitched camp deep inside the Fijian 22 with Alix Popham, Alun-Wyn Jones and Colin Charvis all repelled as they drove for the line. Fiji swarmed in defence. Hook and Shane Williams were swallowed up by three or four defenders at a time. But eventually they had to crack. Wales were furious at not being awarded a penalty try when referee Stuart Dickinson penalised the Fijians for not staying bound at their own five-metre scrum. But the scrum was re-set and Popham touched down for a simple pushover try. Hook took over the kicking duties to convert. Popham was clattered by a late hit from Leaware and Fiji then lost Qera to the sin-bin on the stroke of half-time for use of the knee.Hook missed the simple penalty to round off a desperate first half for Wales. Fiji, down to 14 men for the first 10 minutes of the half, came at Wales hard and strong. Hook was hunted down in midfield by Rabeni, turned over again and Shane Williams settled for conceding a 22 drop out as he retreated to clear up Little's clever chip forward. But Wales had to score first - and they gave the Fijians a taste of their own medicine. Martyn Williams snaffled possession at the breakdown and Tom Shanklin sent Shane Williams away on a searing counter-attack down the right. The diminutive Ospreys winger stepped inside three defenders to score a brilliant 60-metre solo try, topped off by a swan dive, to breath life back into Wales' campaign. After Dwayne Peel's break had moved Wales back into Fijian territory they struck again as Hook combined with Mark Jones for Thomas to score and mark his Test centenary with a try. Stephen Jones - now kicking again - struck the post with his conversion attempt and Fiji still led but Wales had cut the margin to just three points at 25-22. Qera returned - but only to see Wales surge ahead with a second dose of that medicine. Last week, Fiji split the Australian lineout for Rauluni to burst through the middle and set up a try. Today Wales did the same. Peel scampered through the middle and Mark Jones finished off Wales' third try in 11 minutes. Back to their full complement, Fiji regrouped and came again, earning a penalty after some brilliant handling which Little converted to put his side one point ahead. Wales began to ring the changes. Peel was replaced at scrum-half by Mike Phillips and Wales competed for the last 15 minutes with a whole new front row. Fiji seemed out on their feet but still they tested Wales. Bai scooped up a long pass, beat Duncan Jones and as stretched to ground the ball as Thomas tried to tackle him into touch. This time the replays worked against Fiji and as they continued to press Martyn Williams picked off a pass from Little and raced 55 metres clear to score. It was a try which, eight minutes from time, should have sealed the win - but Fiji refused to give up. Delasau cut inside when the overlap was begging and the chance appeared to be gone - but they kept the pressure on and Dewes drove over for the winning score. 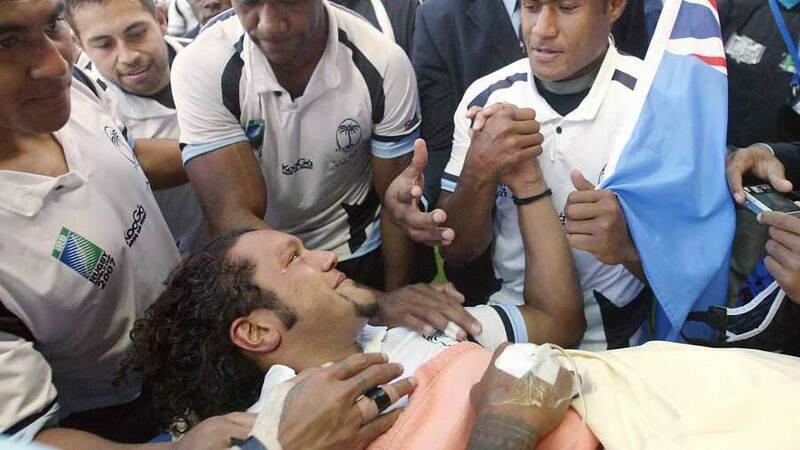 It was a try which sent Fiji to Marseille and Wales home.